Like many others before me, I have recently started wondering why certain photographs attract me. I guess this question naturally raises itself once one starts being interested in photography beyond the classic snapshot. The answer is of course deeply rooted in personal and dynamic preferences; like any taste these can change over time. I hated tomatoes as a kid, now I love them. After looking at many images and trying to distill their very essence down to that single drop of wisdom, it looks like I am a sucker for a well composed image. Well, it could have been worse. (c) Robert Mapplethorpe: Philip Glass and Robert Wilson, 1976. Here a black & white masterpiece by Robert Mapplethorpe (1946 - 1989). His portrait of Philip Glass and Robert Wilson. This photo was taken in 1976, the year both closely worked together on the opera “Einstein on the Beach.” It immediately attracted me; that initial reaction hasn’t changed. The more I look at this picture, the more I appreciate it. I will tell you why in a minute, but remember: it’s a personal thing, you are allowed to disagree. To me this photograph is an example of what I regard the fine-art of photography. At first glance it looks almost casual, but to the keen eye it reveals a careful choreography. Over time, I have discovered more and more little details to cherish. For starters, there’s a subtle play of symmetries and asymmetries. It’s like one of these spot-the-differences games. Imagine the scene without Glass and Wilson. Everything is ready for the shoot, we are patiently waiting for the main acts to enter the stage. And look, there’s already an interesting composition going on; a mirror symmetry. A small gap in the backdrop panels, pretty much at the pictures vertical centerline, acts as the mirror line. Mirrored chairs oppose each other. Glass and Wilson arrive. Sitting closely together, united, their legs crossed in similar fashion, but not quite the same pose. It’s this subtle play of symmetries and overlaid asymmetries that make the picture interesting to look at. The central perspective of the wooden floor boards leads you in, towards the portrayed artists, gives a certain volume to the even-lit photo. The difference between the two sitters, already referred to by the opposing chairs, is most obvious from their appearance. 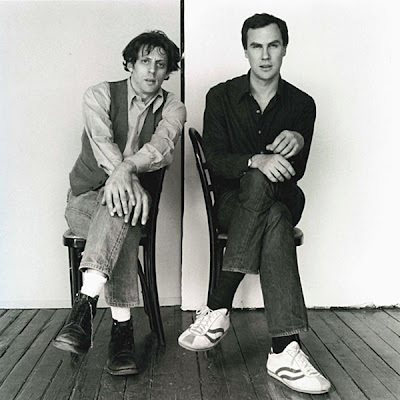 An unkempt Philip Glass vs. a smart-casual Robert Wilson. Glass, with ruffled hair and old boots, casually leaning against the back of the chair. Wilson, with neatly short-cut hair and trendy new trainers, sitting almost straight. This contrast is further enhanced by the opposite tonal values of their oufit: black vs. white shoes, white vs. black socks, light vs. dark jeans, light vs. dark shirt. The gap in the background essentially splits the picture into two frames, a diptych. The two artists united only by being next to each other, in similar pose with crossed legs, and a common ground. Roland Barthes  wrote in Camera Lucida “Wilson holds me, though I cannot say why, i.e., say where: is it the eyes, the skin, the position of the hands, the track shoes? 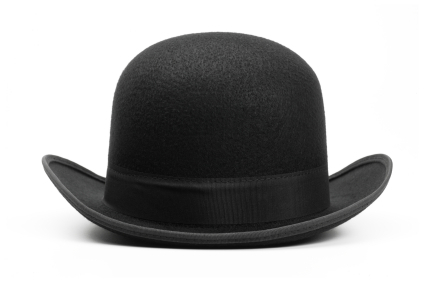 The effect is certain but unlocatable, it does not find its sign, its name; it is sharp and yet lands in a vague zone of myself; it is acute yet muffled, it cries out in silence.” True, for me at least; my eyes are also directed towards Wilson. Mapplethorpe chose a light-gray background for Glass, positioned slighly further aback. Glass almost fades into the backpanel. His skin and shirt tones match that of the background, his dark boots have similar tonal value as the floor. Wilson on the other hand stands out from the plain white background. Dark clothes on pristine white, pristine white trainers on a dark floor. This bias towards Wilson is further emphasised by the white backpanel being slightly larger than the gray backpanel, and Glass leaning towards Wilson. Wilson’s dark clothes, detached straight pose, and facial expression, certainly make him appear more enigmatic. If I squint my eyes, I can almost make out a halo! I can’t be sure if this imbalance, my auto-focus on Wilson, was intended by Mapplethorpe, or is merely a consequence of working the differences between the two. It’s tricky to keep scales balanced, putting equal weight on both sides. Below, a recent portrait of Glass and Wilson taken by Georgia Oetker in 2008. Let’s assume this is a fairly casual portrait, not overly staged. Wilson, still the more trendy of the two, wearing dark clothes. Glass, casual, in light shirt and jeans. 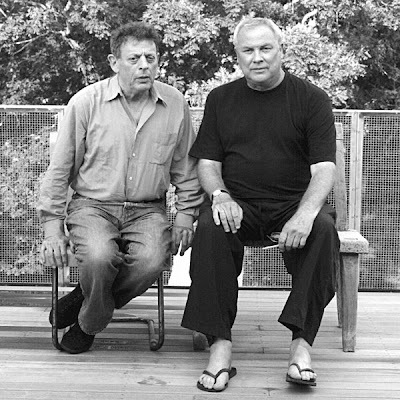 (c) Georgia Oetker: Philip Glass and Robert Wilson, 2008. I’d like to think that Mapplethorpe didn’t tell them what to wear back in 1976. The genius of Mapplethorpe then, was to spot the difference between the two, the contrast that was already there, a natural given, and to enhance this contrast by introducing a subtle play between differences and similarities, closeness and opposition, symmetries and asymmetries. Just like a good chef, he would cook a tasty dish from simple, basic, given ingredients. A quiet picture, taken by a master of his craft. No marching band or fancy mirror-balls here. Hopefully, you’ll agree with some of my observations and musings. Hopefully, I’ll have managed to whet your appetite? The appetite to sometimes look closer at why you like a certain photograph; maybe because of its composition? Because, once you find your why, this picture will be special to you. Roland Barthes, Camera Lucida – Reflections on Photography, Fontana Paperbacks,1988.